BOOM… A blockbuster of a quarter-final is all set for Wednesday as the world number one, Serena Williams will take on the world number five, Simona Halep at the 2016 US Open. Halep defeated Carla Suárez Navarro in the first match of the day over on Louis Armstrong, 6-2 7-5. The first set scoreline was perhaps a little harsh on the Spaniard in the first set with half of the games going to deuce. There were some quality points and Suárez Navarro hit some wonderful backhands; however Halep was the sharper and more aggressive player, and vastly improved from her third round win over Timea Babos that went the distance. Things got a little tight in the second set as Halep twice lost her break and failed to serve out the match at 6-2 *5-4. Perhaps the most impressive aspect of Halep’s performance was her ability to refocus and power through the frustration, of which there was plenty as she flung her racquet towards the end! After going down *0-30 when serving for the match for the second time, Halep reeled off four straight points including two fabulous passes as she marched into a second consecutive quarter-final at the US Open. Halep makes the more aggressive start & her more potent serve & backhand allow her to keep the edge over Suárez Navarro, 62 75. Head-to-head record: Serena leads Simona, 7-1 in their head-to-head. Simona’s lone win was a sensational, 6-0 6-2 triumph in Round Robin action at the WTA Finals in Singapore. Since then, Serena has won their last four matches and dropped just one set in the process. A couple of those matches were very competitive; Serena won in Miami, 7-5 in the third set, while she prevailed in a tight two setter of a final in Cincy, 6-3 7-6(5) in what was a superb contest. Interesting stat: Halep has compiled a wonderful run of form since Madrid, winning 30 out of her last 34 matches and winning three titles in Madrid, Bucharest and Montreal. Halep is 8-2 against top 20 players since Madrid including three top ten wins over Angelique Kerber, Agnieszka Radwanska and Madison Keys. Final thoughts: Halep is playing arguably her best tennis of the year right now and I think she is in the best position mentally to challenge Serena. The world number one though has looked in superb form at this tournament, particularly on serve; in respect of Simona’s recent level and the tough battles they have had in the past, I think that Serena will bring her A-game to this match-up. Fingers crossed for another cracker! September 5, 2016 in Halep, Serena, US Open, WTA. I think this is Simonas time to shine. I don’t think Serena’s draw has been too easy. I think the reason she’s playing so well is because she could see the potential dangers. Makarova is obviously a former top ten player and she loves big matches, as does Shvedova, who reached the Quarters at Wimbledon this year. And Johanna Larrson has gone on a bit of a tear since Wimbledon, making two semi finals (New Haven and Bastad) and a quarter final (Gstaad), beating Vinci and Bacszinsky along the way. I think she’ll be really up for playing Halep and I’d be surprised if it’s too competitive, based on how Serena has been serving and how the court favours big strikers. Serena in 2 sets. Vinci needs to beat Kerber or else she is out of the top 10. I hope Kerber doesn’t under estimate Vinci. I see all Halep’s supporters voted for her. Vinci is the kind of player that could definitely trouble Kerber. On the one hand, Angie’s footwork is pretty impeccable right now and so slices shouldn’t throw her off balance as they did with Serena last year. On the other hand, Vinci is able to take all the pace off a ball and Kerber doesn’t tend to play very well when she’s forced to create her own pace, she starts to overhit. I suspect Robi sees the last year (including the 2015 US Open) as a huge bonus in her career. By her own admission she didn’t expect to beat Serena last year, and I doubt she’d be too upset if she falls out of the top 10 since she wasn’t expecting to be there in the first place. If Serena serves well as she’s been doing recently I think she’ll be too strong for Simona. indeed Paul, it looks like a favourable moment for Simona based on her recent tournaments, even if she is never prepared to upset Serena. at least she must be well prepared to offer a strong challenge. anyhow it seemed that it’s hard for her to hit decent winners, she had a lot of errors lately, not only against CSN but when losing against Kerber as well. Returning the ball for sure it’s not enough against Serena. I’m going to base my prediction off of a few things, besides the head-to-head between Serena and Simona that is 7-1 in Serena’s favor. Serena has played only seven tournaments this year: Melbourne, Indian Wells, Miami, Rome, Paris, Wimbledon, and Rio. Simona has already played in 15 tournaments this year: Sydney, Melbourne, Fed Cup, Dubai, Doha, Indian Wells, Miami, Stuttgart, Madrid, Rome, Paris, Wimbledon, Bucharest, Toronto, and Cincinnati. Serena has accumulated 33 wins to five losses in an 84% winning percentile range. But, Simona accomplished 36 wins to 10 losses in a 73% range. Had Simona pulled out of Romania’s Fed Cup tie, Dubai, Doha, and Indian Wells, I feel like she would have had better results in her win-loss record. But, I’m extremely impressed with how Serena is doing a much better job of taking care of her health. Instead of pulling out of the tournaments halfway through, she has been withdrawing before tournaments start. Also, Patrick Mouratoglou has really helped Serena to raise her level in her game. I mean, who can overpower Serena’s serve, especially after she served 102 aces when she won Wimbledon 2012? Now that Serena has FINALLY tied Steffi Graf’s record of 22 Grand Slam titles, this is a lot of pressure that is off her shoulders. I’ve noticed that ever since she got to 22, she has been a more relaxed tennis player and the serve has drastically improved. Serena has averaged 10 aces, one double fault, 29 winners, and 20 unforced errors. On the other hand, Simona averaged two aces, two double faults, 18 winners, and 22 unforced errors. Simona’s game really fluctuated when she won against Safarova and Babos. 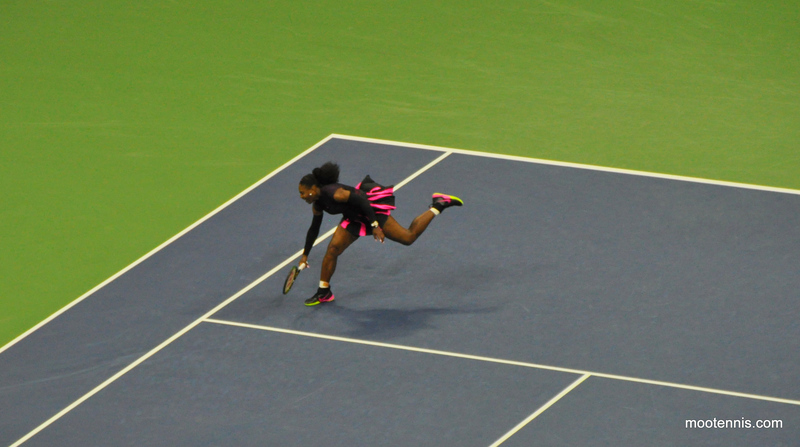 But, Serena has shown that her game is extremely strong, particularly on her serve. While Simona will put up a good fight against Serena, I predict that Serena will take this match in two sets. Seeing as She is now being heralded as the GOAT(308 slam wins), should she lose to Simona, what would that make Simona 😉 , the one who just beat the newly crowned greatest athlete there is?! @Jackie legs – I suspect the compression sleeves has also psychologically improved her serving if not physically. She had always wanted those ever since Raonic first used them, was it two years back I think. Serena has just looked much more relaxed after winning that elusive 22nd Grand Slam title. I suspect that she will be on very high alert mode when she faces Simona tomorrow. Coach Patrick Mouratoglou has been working with the ESPN Tennis Commentator Analysts for these past two weeks for Wimbledon and this year’s US Open. So, we know that he’s been working with Serena every day to make sure that she brings out her A-game in every match. Based on stats between Serena and Simona, I predict that Serena will win this match in two sets. Serena in two! Unless Halep is super fit right now I dont see her beating Williams! That’s what I feel too, even if Simona is super fit. Looking at the stats of Serena, she is just on fire right now. Simona took a medical timeout for an injury for her three-set win over Timea Babos and she has a hard time closing out matches. I’m standing by this prediction. It looks like all the Romanian fans are voting for Simona here, hence the reason why only 14% voted for Serena. But, all the websites are predicting Serena in two sets. So. I’m sticking with that. The US Open website also predicted Serena in two sets. Simons Haley doesn’t stands a chance of beating Serena Williams. I think Serena is the greatest tennis player of time. Pliskova has made it through to her first Grand Slam semifinal. Good for her, right? Well, not so good eventually down the long road tomorrow afternoon. Knowing that Serena will most likely crush Halep in two sets, based on their head-to-head rivalry and match stats, this next match puts Pliskova under lots of pressure. She would be expected to be the next person to beat both the Williams sisters in the same Grand Slam tournament. People are always able to beat Venus, but not Serena, when it comes to Grand Slams. This may be hard to imagine, but I have seen this several times. Serena will always be very alert, if she plays against someone who beat Venus. While Pliskova does have a big serve, I don’t think it’ll be enough to even take a set off of Serena, let alone beating her. Whenever they have these Halep-Serena match polls on here, I AM ABSAFREAKINLUTELY DISGUSTED THAT ALL OF THE VOTES HAVE GONE TO HALEP AND NOT TO SERENA! While Halep has better movement on the court, Serena has better placement with the serve. Both the WTA and US Open websites have predicted that Serena will win her match against Halep in two sets. I’m standing more by WTA and US Open rather than this waste-of-space prediction! Pliskova is an ideal matchup for Serena in so many ways. Everything that Karolina does well, Serena does even better. Then there are the things that Pliskova doesn’t do well that Serena is still great at. But if Karolina does swing freely and Serena gets tight, all expectation being with her, then it could become interesting. Pliskova did a superb job at returning the Venus serve yesterday, getting back serves well over 110mph and starting the point from a neutral position. This could frustrate Serena into making all kinds of errors. Yeah, but Serena will be more sharper than last year’s semifinal. She was going for the Calendar Grand Slam then. This year, she’s going for Grand Slam title #23. Serena’s average match stats are 33 winners, 24 unforced errors, 12 aces, and two double faults. Meanwhile, Pliskova averaged 28 winners, 20 unforced errors, eight aces, and two double faults. This match will be putting Pliskova under lots of pressure, considering that she had beaten Venus in the fourth round and will be under the same expectation to beat Serena in the semis. However, beating the Williams sisters in the same Grand Slam tournament is not that easy. Serena is already aware that Pliskova has a big serve and she’ll know what to expect since Venus played her. Both the WTA (http://www.wtatennis.com/news/article/5873495/title/us-open-thursday-semis-set) and US Open websites (http://www.usopen.org/en_US/news/articles/2016-09-08/usopenorg_day_11_picks.html?chip=1) picked Serena to win this match in two sets. I’m standing by that.